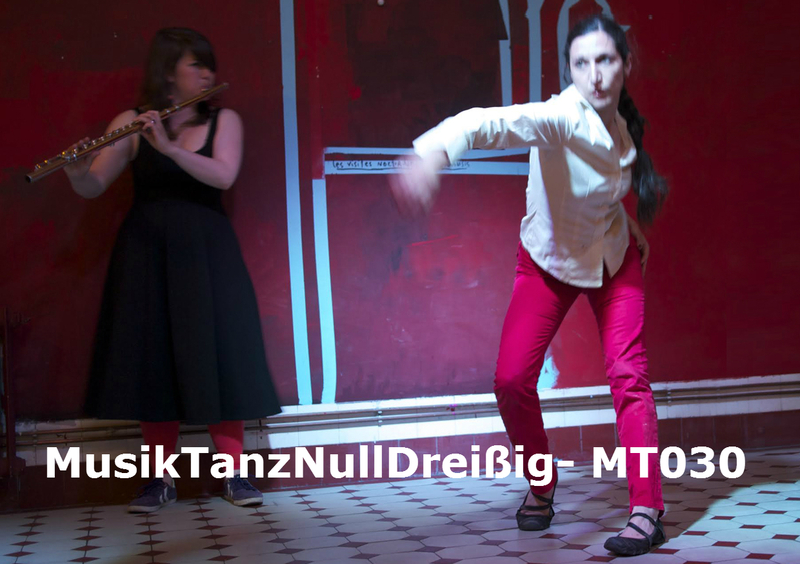 MusikTanzNullDreißig (MT030) is an initiative of flutist Friederike Wendorf and dancer Manuela Tessi.It is a platform aimed at fostering the collaboration of dance and music in performance.It consists of a performance series and practice sessions. Dance: Akemi Nagao, Jenny Haack, Manuela Lucia Tessi. Music: Friederike Wendorf- flutes plus guests T.B.A. Dance:Jenny Doell, Michael Shapira, Barbara Toraldo, Manuela Lucia Tessi Music: Manuel Miethe – saxophones, Wieland Moeller- drums, Friederike Wendorf- flutes, plus guest T.B.A. Practice Sessions: dates and places t.b.a. 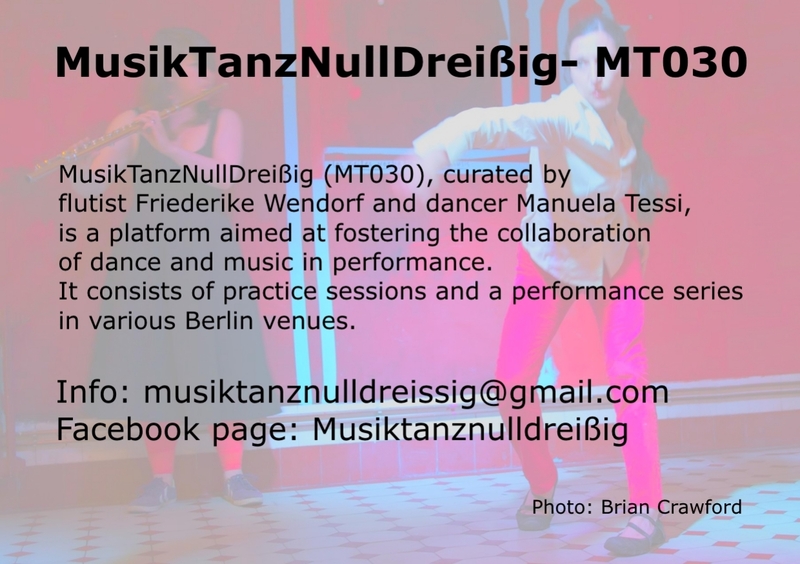 Next to the performance series Manuela and Friederike create a parallel event, the MT030 practice sessions: meetings taking place in a dance studio without public audience. The sessions are aimed at supporting the research of dance and music improvisation. They are open to everyone who has an interest in developing the practice. In the sessions Manuela and Friederike wish to create the possibility of new meetings and the sharing of ideas, that eventually will be developed into a performance. Manuela is an Amsterdam- Berlin based contemporary dancer whose work focuses on the relationship between movement and live music. She works with Katie Duck and Magpie a.o. and for many years has been curating dance and music events at cultural centre OT301. Friederike is a Berlin based flute player, whose artistic focus lies in improvisation, particularly the relationship between sound and movement. She studied at Conservatoires in Berlin, Cologne and Amsterdam, where she finally entered the music and dance improvisation scene, receiving valuable input by Katie Duck and working on own projects. Friederike and Manuela met in the improvising scene of Amsterdam. Noticing the interest and potential in the local artists community of Berlin, they decided to create events, that provide a dedicated space where dance and music can mutually contaminate and inspire each other. The MT030 performance series started in November 2014 and is usually hosted by Club der Polnischen Versager and Greenhouse Plateau Gallery. These locations are chosen on purpose to integrate and expose the performances to the nightlife of Berlin and to escape the sometimes clean and dry atmosphere of dance studios. Manuela and Friederike hope, that this way the work will be exposed to a broader audience, not only necessarily made of insiders of the dance-music scene, but as well locals, who would come to the bar to have a night out.